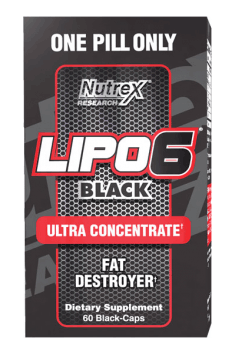 Nutrex Lipo-6 Black Ultra Concentrate is a unique fat burner with thermogenic activity, containing a number of substances with synergic lipolytic and stimulant effects that let you achieve results you haven’t even dreamed of! The composition of the preparation helps to burn stubborn fat thanks to the content of such substances as Yohimbine or Rauwolscine. It’s one of few supplements whose single dose is enough to achieve satisfying results. Its unique composition makes it one of the strongest legal fat burners! Caffeine anhydrous is a natural stimulant that has a thermogenic effect and reduces appetite thanks to its ability to stimulate adrenaline and noradrenaline production. It has been proven to increase the production of neurotransmitters in the central nervous system, such as dopamine, acetylcholine, and even serotonin, which makes it a stimulant and lets it improve cognitive functions. The overall influence of caffeine on the organism helps to maintain the efficacy of workout and a good mood despite a calorie deficit. Theobromine anhydrous is a bitter alkaloid similar to caffeine both in terms of its structure and activity. Theobromine has been proven to increase the production of nitric oxide, which has the ability to dilate blood vessels and in that way provides increased thermogenesis and the sensation of a muscle pump during workout. Apart from that, it has a diuretic effect, thanks to which it allows better muscle definition. Theobromine has a long half-life, thanks to which it has a prolonged thermogenic effect, and when combined with caffeine, it can give you a great energy boost and focus during workout. Advantra Z (50% synephrine) is a compound obtained from bitter oranges, and many people consider it as a legal substitute for ephedrine. Advantra Z has a thermogenic effect provided by the content of synephrine. The biological effect of the bitter orange extract stems from the fact that the active substance is able to bind and activate β-adrenergic receptors, thanks to which it activates metabolic transformations and increases basal metabolism. Moreover, it has a slight stimulating effect on α-adrenergic receptors. It’s a compound that works synergically with caffeine. It doesn’t cause an increase in blood pressure. Yohimbine is an indole alkaloid isolated from the bark of an African tree, yohimbe. It’s a supplement belonging to the group of stimulants whose thermogenic and lipolytic effect is caused by its ability to stimulate noradrenaline release and a twofold effect on adrenergic receptors. An increase in adrenaline and noradrenaline production is connected with the reduction of appetite. When it comes to alpha-2-adrenergic receptors, they are very common in adipose cells, particularly in the so-called stubborn fat. By increasing adrenaline secretion, yohimbine causes its binding with β1- and β2-adrenergic receptors, which stimulates the breakdown of adipose tissue, and through its direct inhibitory effect on α2-adrenergic receptors, it inhibits their activity consisting in maintaining adipose tissue. Another important effect on adrenergic receptors is stimulating vasodilation, which increases blood flow in muscle tissue; that, in turn, is responsible for a muscle pump and the thermogenic effect. Combined, the effects of yohimbine result in the stimulation of basal metabolism. Rauwolscine is a yohimbine isomer, so its biological effect is the same – it blocks α2-adrenergic receptors, inhibiting its negative effect on fat burning. The safety of using a yohimbine derivative as a fat-burning substance stems from the fact that it doesn’t cause fat burning directly, but it helps to use fatty acids, obtained in the process of lipolysis, as a source of energy more efficiently. The mechanism and power of Rauwolscine’s activity makes it one of the strongest fully legal compounds responsible for burning stubborn adipose tissue. Apart from its thermogenic and appetite-reducing effect, mood improvement can also be observed. The effect is a consequence of activating the right receptors in the central nervous system, which results in an increase in the level of serotonin, called the happy hormone for a reason! To sum up, Lipo-6 Black Ultra Concentrate is an efficient fat burner whose formula helps to burn the so-called stubborn fat in many ways without negative effects on muscle tissue. The supplement, which contains so many synergically active compounds, will provide powerful fat burning and the feeling of happiness during every training session. Take one capsule in the morning and another one 30 minutes before workout. Don’t take more than 2 capsules a day. Take one capsule in the morning and another one 30 minutes before lunch. It is recommended to begin with one capsule a day. In order to obtain maximum effects, take it on an empty stomach and avoid taking it with high-carbohydrate meals. Do not use it in the evening or combine with other stimulants. Because the formula is extremely powerful, remember not to take more than two capsules a day under any circumstances! In order to obtain maximum benefits, take the preparation 30 minutes before a meal. Do not take the preparation later than 6 hours before sleep. People who haven’t used preparations of that kind and those sensitive to the activity of stimulants should only take one capsule a day for the first several days.